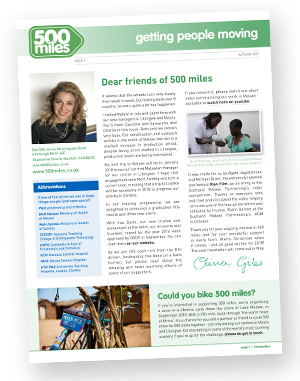 Thank you for taking the time to visit 500 miles’ website. We are a Scottish charity founded in 2008 to help people with mobility difficulties and to give them a chance to live independent lives. As a quadruple amputee myself, I know how important that independence is. The charity’s name comes from The Proclaimers’ famous lyrics, “I would walk 500 miles”, because that’s our aim – to get disabled people in Africa up and walking. If you’d like updates on our activities, please join our mailing list. Through this you’ll receive our newsletter with our latest fundraising stories, project updates and patient stories. I’ve been given a second chance to enjoy life – everyone else deserves that too. Our mission statement at 500 miles is that – “all who need and can use a prosthetic or orthotic device to improve their quality of life, will have that chance”. Please click here to download our latest edition of the newsletter. I hope you enjoy it! If you would like to receive links to our newsletters by email when they are issued, please click here to send us your email address. Please tell us here if you have changed your email address or would like us to use a different one.